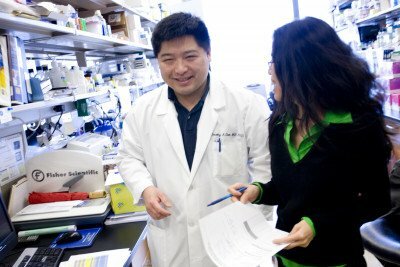 Researchers from Memorial Sloan Kettering have published two studies that provide clues about genetic mutations that affect cell behavior and play a role in several types of cancer. The findings eventually could guide the development of new treatments. Both studies, published February 15 online in the journal Nature, investigated changes in a gene called IDH. This gene produces a protein that plays a critical role in cell metabolism. Mutations in IDH have been found in several types of cancer – including colon cancer, prostate cancer, some leukemias, and brain tumors known as intermediate-grade gliomas – but the connection between these mutations and cancer has been unclear. One of the studies was headed by radiation oncologist Timothy Chan and Dr. Mellinghoff. They found that, in glioma cells, mutations in IDH cause changes in the epigenome — the molecules that control how genes behave. Reconfigurations in the epigenome are a hallmark of cancer. They do not alter the genetic code of DNA, but can nevertheless influence the behavior of a cell by turning genes on or off. The team showed that by introducing IDH mutations into human cells, they could re-create the epigenetic changes observed in glioma cells. These changes helped alter the differentiation state of the cells. The second study was overseen by Memorial Sloan Kettering President and CEO Craig Thompson. That research showed how changes to histones, proteins that help package DNA in a cell’s nucleus, might lead to the reorganization of the epigenome. Specifically, the investigators looked at the effects of IDH mutations on histone methylation, an epigenetic change that can silence genes.